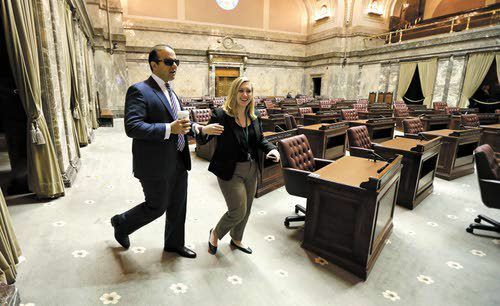 OLYMPIA – As Washington state prepares to swear in its first blind lieutenant governor, the Senate has undergone a makeover that incorporates Braille into that chamber’s floor sessions. On a recent day just weeks before the start of the legislative session that begins Monday, the desks of 49 senators got an upgrade: a system that will allow Lt. Gov.-elect Cyrus Habib to know by the touch of his finger which lawmaker is seeking to be recognized to speak. “I’m really excited to show the public, particularly school children, that anything is possible,” Habib said Thursday, just hours after testing the system out. Habib, a 35-year-old attorney who completely lost his eyesight to cancer at age 8, was first elected to the state House in 2012 and won a state Senate seat in 2014. In November, he beat Republican Marty McClendon to replace Lt. Gov. Brad Owen, a Democrat who is retiring after holding the post since 1997. Habib will be sworn in on Wednesday. The second highest position in the state, the lieutenant governor is best known as the president of the Senate and presides over that chamber during the legislative sessions, ensuring that protocol is followed and weighing in on parliamentary questions that arise during debate. Change comes slowly to the Washington state Senate – often called the more deliberative body – where voice votes are still conducted instead of the more expedient electronic vote system the House employs. But because the lieutenant governor is charged with controlling the Senate debate, Habib will make the call on who to recognize first when a parliamentary motion is made, or a request to speak on a bill is registered. Usually, a lawmaker jumps up out of his or her seat and addresses the presiding officer. But even though Habib, as a former member of the Senate, may recognize the voices, when a bunch of lawmakers jump up – as they occasionally do – it would be impossible for him to know who was first without a staffer telling him. Now, lawmakers will instead push a touchscreen installed on their desks as they stand. A list, in order of those who pushed the button, will be transmitted to the rostrum, where the Braille display in front of Habib will go from flat to a series of raised dots that spell out the lawmaker’s name. When Habib joined the House, he was given a Braille reader and software on his laptop that provided both Braille and text-to-speech translation for the multitude of bills, emails and news stories he reads daily. And while the audio software is his preferred system, the added multitasking of calling on lawmakers made the Braille reader for the rostrum essential. In addition, the Senate purchased a Braille printer so that Habib can read in advance things like who’s leading the chamber’s prayer, or bringing the flags to the rostrum. Deputy Secretary of the Senate Paul Campos said that while the Braille upgrade is unprecedented, it’s in line with ensuring the chamber runs as smoothly as possible. Campos said that the touchscreens cost about $57,000 and the Braille reader, printer and software was about $12,000. Habib, who already hands out Braille business cards, said that the new system in the Senate is just another way to show people who visit the state Capitol the various ways technology has evolved and is used in state government.